Kuchen is the German word for “cake,” and it is often made with fruit and served with coffee. 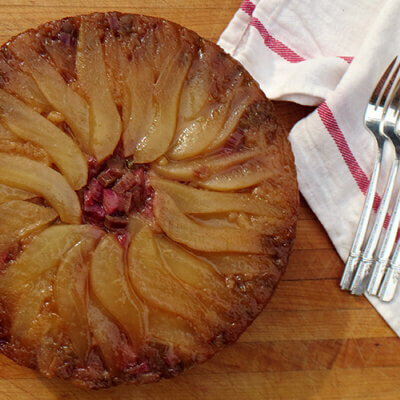 This pear-filled version is flavored with a hint of pear brandy. On a drive through the winding orchard-lined roads of Oregon’s Hood River Valley in late summer, you may come across a peculiar sight: Green Bartlett pears growing inside glass bottles. That’s Clear Creek Distillery’s pear brandy in the making. They actually affix clear-glass bottles to the budding pear trees, and the pears grow right inside. Then, at harvest time, the bottled pears are picked and pear brandy is poured in, just in time for holiday celebrations. In this recipe, you can use any pear brandy you like. 1. Preheat the oven to 350˚F with a rack in the center position. Rub a 12-inch square of parchment paper with butter and place it in an 8-or 9-inch cast-iron pan, butter side up. 2. In a medium bowl, whisk the flour, ginger, baking powder, and salt. In a separate large bowl, or in the bowl of a stand mixer, beat the eggs until foamy and slightly thickened, about 3 minutes. On low speed, beat in the granulated sugar, brandy, and vanilla. Add the buttermilk and beat just until combined. 3. Peel, halve, and core 2 of the pears, and cut them into 1/2-inch-thick pieces. Keep the remaining pear unpeeled, and cut it into thin slices for the top. 4. Add half of the flour mixture to the wet ingredients, and stir until just combined, then stir in half of the melted butter. Repeat with the remaining flour and butter. Gently fold in the chopped pears. 5. Pour the batter into the parchment-lined skillet and spread it in an even layer. 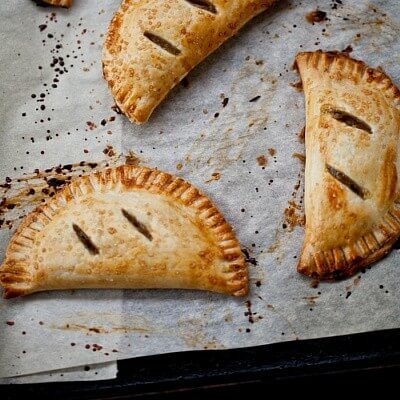 Arrange the pear slices in a fanned pattern on top, and sprinkle with the turbinado sugar. Bake until deep golden brown and a cake tester inserted into the center comes out clean, 55 to 65 minutes. 6. Allow the cake to cool for at least 5 minutes before cutting. It can be served warm or at room temperature, dusted with confectioner’s sugar.